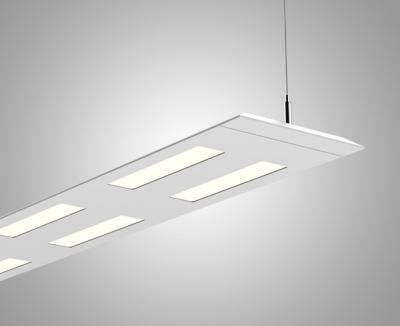 Acuity Brands' Olessence is a suspended luminary for commercial and professional office spaces, which combines OLED and LED light sources (Acuity's Duet-SSL tech). The LEDs offer the primary source of ambient illumination while the OLEDs offer soft and calm diffused lighting for comfortable perceived brightness. The luminaire also supports integrated sensors for daylight dimming and occupancy detection. Acuity offers several device configurations (LEDs at 3000K, 3500K or 4000K and a CRI at 80+ or 90+). Acuity Brands announced the Olessence on May 2016, but did not reveal the actual release date or any price information.